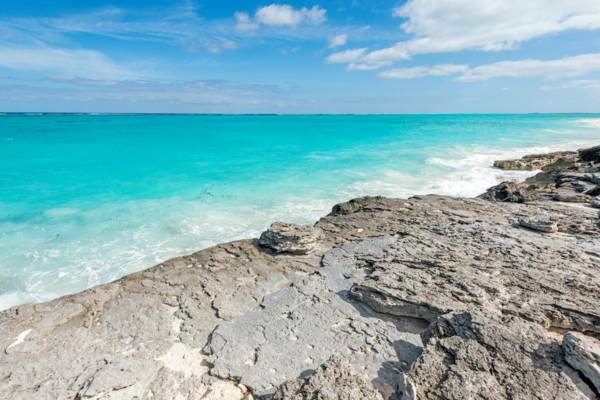 The low cliff coastline of Nongatown Landing, Middle Caicos. Located between Bambarra Beach and Platico Point, Nongatown Landing is a secluded and uninhabited section of coastline. Much of Nongatown Landing is low marine limestone cliff at the water’s edge, however, beach gradually takes over to the east. The water is typically a quite vivid shade of turquoise, but there can be small amounts of floating seaweed and flotsam at times. Two sets of ruins can be found in the general area. On the bluff above the coast (about .3 miles or .5km inland), the field walls and stone skeleton of Ferguson Plantation still stands. This loyalist-era site was at one time a successful cotton plantation. To the west are the few remains of a more-modern venture, namely a cargo port. Here, the rusted remains (circa late 1980s or early 1990s) of a barge, crane, and shipping containers are found. The easiest point of access is found on the eastern end of the Conch Bar coastal road. This highly scenic paths leads along the top of the bluff fronting Conch Bar Beach and Platico Point. After you pass the crane ruins, simply stop at one of the short bulldozed tracts to the ocean. Last reviewed by an editor on 13 December 2016.